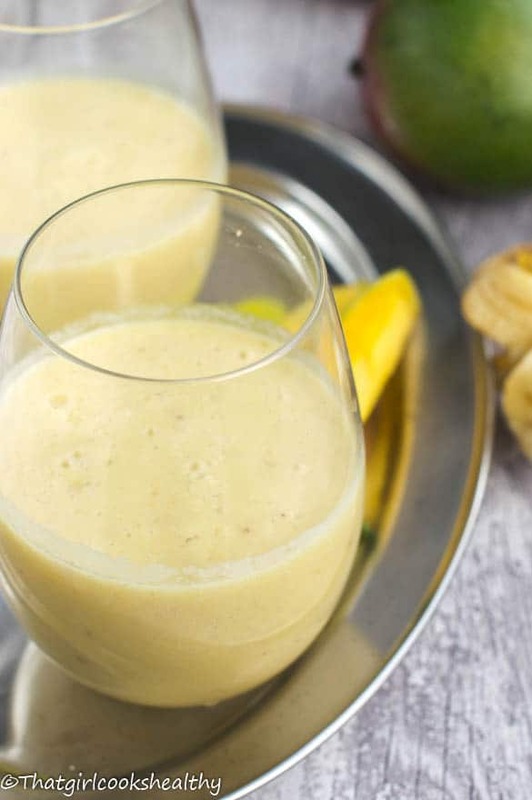 Sweet mango banana pineapple smoothie – this dairy free quadruplet recipe is great to whip up in the morning and drink before enduring a busy day. Now that the weather is slowly transitioning into spring over here. I’m beginning to come out of my shell in small increments. You see I’m not a huge fan of winter, my energy levels are lower than ever and I feel miserable. Thankfully with the weather improving this means I can apply my thinking cap for some sizzling summer recipes; starting with this gorgeous smoothie. It is a pre-season smoothie (seems more of a summer time smoothie). The sunshine was beaming down on my window pane which caused the sudden urge for a tropical smoothie. 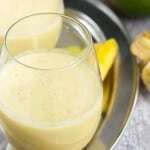 What’s in a sweet mango banana pineapple smoothie? The foundation for this sweet mango banana and pineapple recipe is made with coconut milk. I tend to favour coconut milk over other dairy free milk for a number of reasons; I enjoy the taste, it can be versatile (to a degree) and it is by far the cheapest nut milk to make. The mango, banana and pineapple trio is packed with a multitude of vitamins and minerals and can serve as a meal replacement and mixed with chia seeds for a good source of protein. 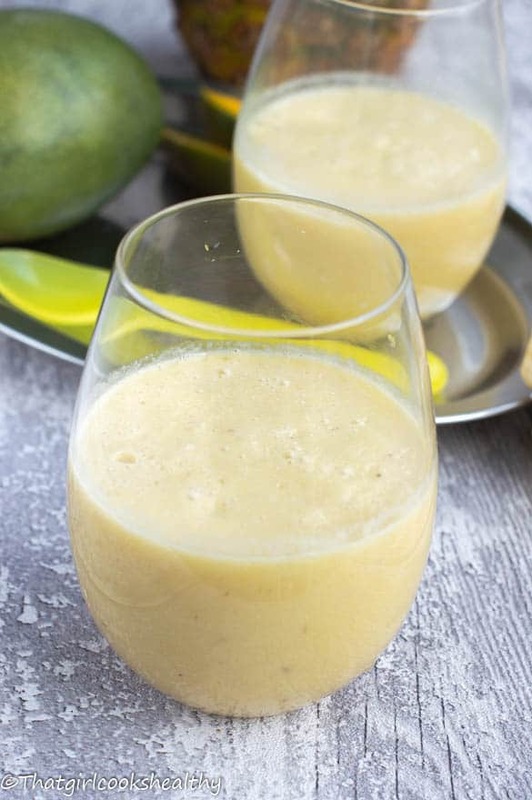 This sweet mango banana pineapple smoothie will definitely serve as a good nutritional source of energy for people who are constantly on the go as it takes less than 10 minutes to prepare and make. Also, if you’re seeking a quick meal I would recommend this drink as it is protein enriched, the digestive system takes a long time for protein to be broken down, you may have noticed this yourself, if not bear this in mind the next time you eat some protein, do you feel fuller? The slow digestive process has an advantage, it will leaves you feeling satisfied for longer, keeping hunger pangs at bay. This sounds delicious!! I’ll have to try it. Thanks for sharing!! You’re welcome Amanda. There are more recipes to come.